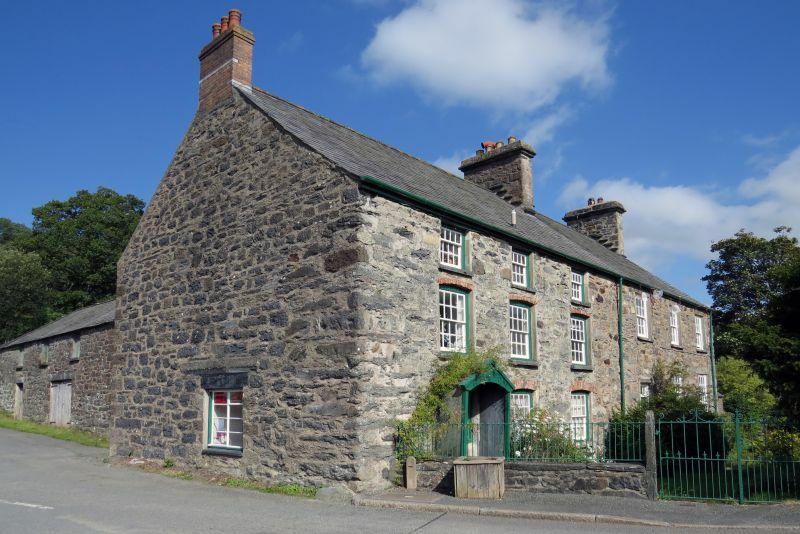 Location: Prominently located in the centre of the village at the W approach to Pont Ysbyty Ifan. Late C18 or early C19 inn, formerly the `Penrhyn Arms', after Lord Penrhyn of Penrhyn Castle, owner of the estate from 1856. Alterations and improvements appear to have been carried out during the third quarter C19, after Penrhyn's acquisition. These included the addition of the adjoining farmhouse and continuous (re)-roofing with it, together with a substantial rejustification of the rear and S gable end. The building is currently (November 1996) used as offices and for domestic purposes. Large 3-storey, 3-window building of random rubble construction with medium-pitched slate roof, continuous with the adjacent Pen-y-Bont farmhouse. Shared stone chimney to R with simple cornice and weathercoursing; small, simple brick end chimney to L. Entrance at L via a late C19 slate-slab porch with plain wooden bargeboard and segmental opening; part-glazed door with narrow 3-pane vertical window incorporated to R. Recessed 16-pane unhorned sash windows to ground and first floors, with projecting slate cills and cambered red brick heads; those to the first floor are one header deep, the ground-floor heads are double. Square 12-pane sashes to third floor, under the eaves. Symmetrical rear facade with central boarded door and flanking 6-pane sash windows to ground floor. 12-pane casements to upper floors, those to the first taller and, as with ground-floor openings, with dressed slate lintels; large ground-floor window with modern glazing to S (road-facing) gable. This was not inspected at the time of survey (November 1996), though is currently used as office space. Included for its special historic interest as a late C18 or early C19 village inn in a prominent central position. Group value with other listed items in the village centre. Adjoining the former inn at the W approach of the Pont Ysbyty Ifan, in a prominent river-side location. Prominently sited at the crossroads at the western end of the village and enclosing a small farmyard behind Pen-y-Bont; facing the B 4407 to the NW and the main Ysbyty Ifan street to the SW. Adjacent to Pen-y-Bont farmhouse to the NE and facing a small farmyard to the W.
On the W bank of the river Conwy, at the end of the garden in front of Nos 1-2 Mill Street. Prominently located in the centre of the village and carrying the main road over the Afon Conwy.